To the south of Martinique is the tiny village of St Anne. Most yachties visit St Anne, usually because it’s a fair anchorage and it’s close to the chandleries and marinas. During our recent visit, I reckon over two hundred yachts and catamarans were at anchor at St Anne. Le Marin, and Port de Plaisance where hundreds of boats are berthed or on anchor, is a 2nm dinghy ride away. This is the main location for chandleries and getting any boat work done. Fortunately for us we had no need to visit Le Marin’s chandleries, although we did stroll through the various shops and boat supply stores anyway. We haven’t been here since April 2015 when we crossed the South Atlantic. St Anne is a pretty location, with a few restaurants, souvenir shops and the like. The small church greets you as you leave the dinghy dock. Behind the church is a winding path that takes you up a hill with excellent views of the bay. One sunny day we walked an hour or so south through the mangroves along the coast to Pointe Salines. Plenty of people were also on the walk with many having BBQs and picnics within the mangroves and near dangerous manchineel trees. About one kilometre south of the village is the Hotel Caritan where yachties can take their laundry to a self-serve laundrette. In the village is a small grocery store and a covered fruit and veg market. After a few days though with much wind chopping up the water and hundreds of crazy charter yachts anchoring too close, we decided to leave and headed up the west coast to one of the prettiest areas in the Caribbean (another favourite of mine) – Les Anses d’Arlets. Petit Anse, just south of Grande Anse, is a gorgeous village with little to offer except clean beaches, clear, clear water, turtles, good anchorage, and a boulangerie with excellent cakes and baguettes! There’s a post office, customs check-in at Cyber Base. For some exercise, a walk from Petit Anse atop Morne Champagne has you in Grande Anse within an hour then about a 25 minute walk back along the road. Now we are back at Fort de France and will leave here in a few days. It’s been a nice stay over the past five weeks and I hope to return to this beautiful part of the world again soon. 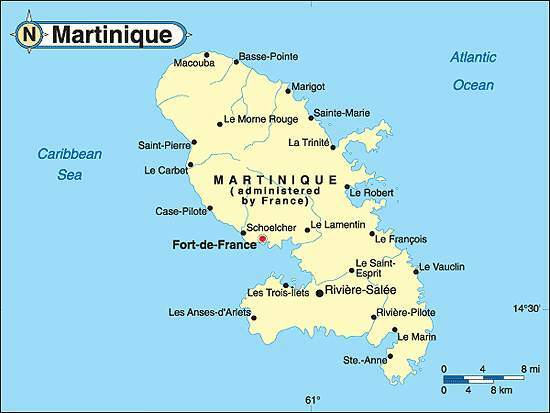 Aside | This entry was posted in 2016, 2017, Martinique and tagged Caribbean, Les Anses d'Arlets, Martinique, Petit Anse, St Anne. Bookmark the permalink.